Remember all those end-of-the-world headlines about cryptocurrency last month? They’re starting to look a little ridiculous. We chronicled them as they were happening. First the Chinese authorities lowered the boom on “initial coin offerings” — similar to IPOs for a stock. Then they moved to shut down cryptocurrency exchanges. That all happened in the space of a week after Labor Day. Yes, bitcoin took a 30% spill as a result. But as we write this morning, it’s recovered well over half of that loss. With apologies to Mark Twain, reports of cryptocurrencies’ demise in China were greatly exaggerated. This is exactly what we told you amid the “crypto is doomed” talk three weeks ago: The Chinese can throw up roadblocks, but tech-savvy crypto mavens will find workarounds. “One of the questions I’m often asked about cryptocurrency is ‘Is bitcoin in a bubble?’” says James Altucher — the newest big-name contributor to the Agora Financial team. More recently JPMorgan Chase CEO Jamie Dimon and Bridgewater Associates’ Ray Dalio, chairman of the world’s biggest hedge fund, did their own bitcoin-bashing. The problem that establishment types have with cryptocurrencies is the same one they have with currencies in general. “Valuation of currency is difficult,” James explains. “Unlike real estate or stocks or bonds, currency doesn’t intrinsically produce an income stream — dollars stuffed under a mattress won’t increase in value over time by themselves, although ownership of a stock might. Consider the telephone, James says: “If I’m the only person in the world that has a telephone, it’s not very useful. If my friend gets one too, it becomes more useful. If everyone in town has a telephone, it’s even more useful. In economic terms, the value of my telephone grows with each new person that gets one. “Currencies benefit from the same phenomenon. If I’m the only person in the world that accepts a currency, it’s not very useful. However, as more people are willing to accept a currency, the utility of the currency actually grows. And don’t forget that crypto threatens to gore the oxen of Buffett and Dimon and Dalio. Think about how Uber has turned the taxi business upside down, says James: ‘Before Uber became commonplace, the idea of getting into a stranger’s car seemed borderline insane. Taxi companies would have you believe that the minute you stepped into a stranger’s car, you were going to get stabbed (best-case scenario). [Ed. note: We still have copies available of James crypto primer, Cryptocurrencies 101: How to Make a Fortune From Digital Currencies. This book will answer all of the most common crypto questions you have. And you couldn’t ask for a better expert: James has had a hand in the crypto market since 2013. He sold his book Choose Yourself in a bitcoin-only store he created a month before it was released on Amazon. He’s had a hand in some ICOs — initial coin offerings — these last 18 months. And he’s made $1.8 million off a single crypto trade. The major U.S. stock indexes are reaching still higher into record territory on this Thursday morning. The Dow has crested 22,700. The S&P 500 is now past 2,540. No big economic numbers today. The monthly jobs report is due tomorrow, which will likely be distorted by the effects of the September hurricanes. Well, distorted more than usual — heh. 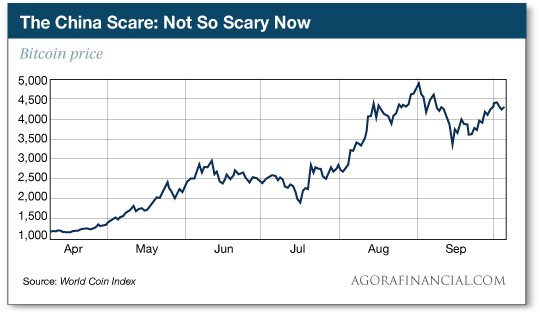 Gold is once again spinning its wheels at $1,274 — and its weak performance of late might have something to do with events in India. Ordinarily, gold demand in India perks up this time of year in advance of the holiday Diwali — when gold is often given as gifts. That’s the “love trade” in gold described by longtime friend of The 5 Frank Holmes, from the U.S. Global mutual fund family — his shorthand for the cultural affinity many Asians have for gold. But not this year: The Economic Times of India reports that demand has been cut in half because the government is giving extra scrutiny to all gold purchases above 50,000 rupees — about $768. In contrast, sales of cars, TVs and refrigerators are up 15% from a year ago. It’s all part of the Indian government’s ongoing efforts to track and tax as many transactions as possible — going back to a sudden ban on the country’s most common bank notes in late 2016. On the plus side for the Midas metal is the fact “we are running out of gold,” says the chief of a major gold miner. At the Mines & Money conference in Toronto this week, Goldcorp Chairman Ian Telfer spoke up about the “peak gold” phenomenon we mention here from time to time. If you’ve been reading us longer than a year, you might be familiar with this chart. 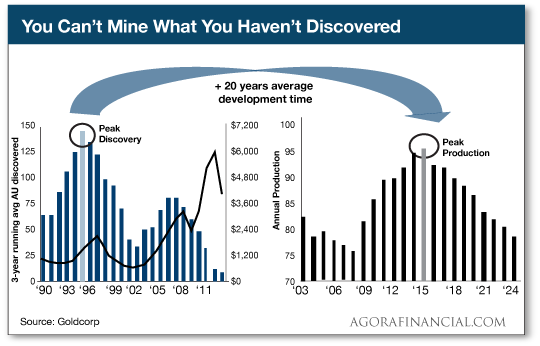 On the left side, you see how discovery of gold deposits peaked in the mid-1990s… and you see that gold production peaked in 2015. Now for the part of the Republican tax plan that might turn out to be “beautiful,” to use the president’s term. We took some shots at the plan yesterday and especially the day before. But it delivers one unalloyed good, says our income specialist Zach Scheidt. And Uncle Sam has his hand in corporate pockets not once, but twice. “Don’t forget that this is part one of our ‘double taxation’ system. Because corporations are taxed on their profits first and then when they pay investors a portion of profits, the investors pay taxes again on the same profits. “Under the new tax plan, corporations will pay just a 20% tax rate on profits. Stands to reason more money for corporations means more money for investors by way of healthier share prices and fatter dividends. Perhaps the biggest winner will be Apple — sitting on $261.5 billion in cash, much of it parked overseas. To learn about some of the other winners Zach is eyeing, give this a look. “Tax reduction or tax increase?” a reader writes skeptically about our coverage of the Republican tax plan earlier this week. “While the details need yet to be worked out I am afraid the ‘expert’ analysts are overly negative. The worry about health care and investment cost deductions, even mortgages, shows a lack of tax code understanding. “Example: The national average home mortgage interest deduction is less than $12,000. The Trump plan provides for $24,000 standard deduction. In other words itemizing is meaningless for average taxpayers, as they already get $24,000 without the need of saving receipts. With an average median income of $80,000, you’d pay $6,720 in taxes, or an effective rate of 8.4% — That’s half of what a billionaire has to put up. “Now, if you lived in expensive and high-tax states like California or New York with substantially higher incomes and formerly deductible state and local taxes, you might not fare quite as well. Perhaps you vote the tax grabbers in your state out of office or move, since you belong to the upwardly mobile population. Many have done so already. No tears here. Why should a Florida, Texas or other no- or low-tax state resident pay for your tax deduction? “How ‘experts’ conclude the tax plan is actually a tax increase beats me. The 5: Remember, the GOP congressional leadership is adamant that tax reform be “revenue neutral.” That means every dollar of tax relief will have to be offset with a new dollar raised by closing “loopholes.” It’s inevitable that some people’s taxes will go up even as others’ go down. The most potent illustration we can think of: While the standard deduction would be nearly doubled under this plan, the personal exemption goes bye-bye. For a two-child couple who doesn’t itemize, that one change would add $16,200 to their taxable income. Meanwhile, their standard deduction rises by only $11,600. All else being equal, their taxable income is $4,600 higher. The more kids they have, the worse the math gets. Yes, the child tax credit might be raised, but there’s no guarantee. And yesterday’s Wall Street Journal points out that raising it from $1,000 to $1,500 still won’t offset the loss of the personal exemption for households in the 25% bracket. “I sometimes wonder what species our various governments recruit from under rocks and in swamp grass to populate their desks and cubicles. While most people probably have a negative reaction to the term ‘bureaucrat,’ our general population in its collective wisdom continues to yearn for government solutions to their problems, blissfully unaware that any ‘government solution’ will by definition involve a bureaucrat coming to the rescue. The 5: Good choice — especially if you’ve got a bent for entrepreneurship. We’ll have more to say about that in the coming days and weeks. But if you still feel as if you’re fumbling in the dark when it comes to crypto, you really need a copy of James’ book Cryptocurrencies 101: How to Make a Fortune From Digital Currencies. There, James reveals his one-of-a-kind crypto script that delivered him a $1.8 million payday. Grab your copy right here.